Why Egypt travels the ultimate destination? Egypt is a land of mesmerising pyramids. But this country is not only about pyramids. There are many other things due to which Egypt are considered as one of the best and ultimate travel destinations. This is obvious from the fact that the number of tourists travelling to Egypt has increased in a big way in the past few years. One of the main reasons that many people opt for Egypt travels tour is that there are many things to do in this amazing country. This is one country which has a number of places of touristsâ&#x20AC;&#x2122; interest. Let us check out some of the important places that tourists can check out when they visit Egypt. Pyramids of Giza: The number one reason due to which people opt for Egypt travels are the pyramids of Giza. This is one of the seven wonders of the ancient world. These are the tombs of the Pharaohs which is guarded by the mighty Sphinx. Luxor's Karnak Temple and the Valley of the Kings: These are important places in the town of Luxor. The tombs and the temples which is kind of an open-air museum is truly amazing and worth watching. Cairo: Get firsthand experience about life in Egypt by visiting the old Cairo city. This is one of the most amazing cities. With the narrow lanes, Al-Azhar, Mosque, Sultan Hassan Mosque and Bab Zuweila are truly worth visiting. Aswan: Looking for tranquillity? Then you have to come to Aswan in Egypt. Visit the Elephantine Island,Nubian villages, camel ride to St. Simeon monastery in this wonderful city. Abu Simbel: This is the temple of Ramses II. One of the most incredible things about this temple is that it was moved from its original setting. You must look at the incredible wall paintings and the colossal statuary. Egyptian Museum: In the year 2019 one of the biggest museums will be open to the public. This is one of the biggest museums belonging to a single civilisation and here one can find exhibits of King Tutankhamen. White deserts: One of the most important places that every adventure lover must visit when they are in Egypt is the white desert. The landscapes and the natural scenery are amazing. This is also one of the best places for adventure sports lovers. Waste no more time! Book your Egypt travel package today! It must be noted that this is not the complete list of the wonderful places that Egypt has. There are many such amazing places in Egypt that you must visit. For this, the first thing that you must do is book your Egypt package. Wondering how to make all the reservations? 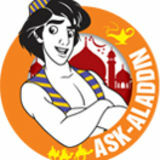 Then all that you have to do is opt for a good travel company that organises trips to Egypt. Based on your budget and preferences they will work out the best-customised packages. Egypt is truly an amazing place and you will realise this only when you go there and check out the wonderful places in this country. 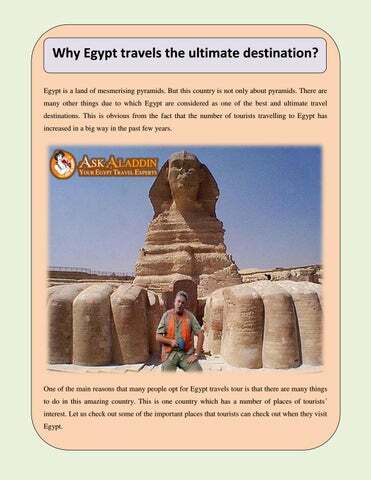 Why Egypt travels the ultimate destination?